I love to open up my home and invite friends and family over for celebrations. And the holiday season provides irresistible opportunities to throw great parties that people will remember. My first priority is always my guests, and I ensure that they are well fed, entertained, and delighted. Good food is vital to any party. Hungry guests are not happy guests, so I have a wide variety of food available for the duration of the party. During the holidays, a time when people tend to overeat and overindulge, I offer some healthful party fare in addition to seasonal favorites. Give any recipe a boost by adding nuts, mushrooms, cruciferous vegetables (broccoli, cauliflower, radish), and edamame (soy beans). You can make your own party favorites more healthful by adding foods, herbs, and spices that increase energy and vitality, help prevent the diseases of aging, and taste great. For example, add curry powder to a rice dish, garlic and ginger to a stir-fry, or citrus to a sauce for poultry. Here’s are some of my favorite dishes to add to a party buffet. Stuffed Turkey Rolls – I pack these turkey cutlets with my Savory Stuffing, roll them up! Here I severed with a cranberry compote. Grilled Swordfish – The secret to this dish is the oyster sauce in the marinade. Mama’s Chicken Sauté – My mother made this dish for our family dinners whenever we wanted comfort food. It’s a super easy dish to prepare and is great for entertaining. Tropical Yams – Heart-friendly yams are tarted up with lime juice and shredded coconut in this festive side dish. Brussels Sprouts with Pomegranate & Walnuts – Brussels sprouts, pomegranate with walnuts and three common ingredients are all that is needed to put together this colorful and crowd-pleasing side dish. Wild Rice and Quinoa Salad – This hearty, filling salad has a nice mix of textures thanks to the chewy grains, crunchy raw vegetables, and soft-cooked vegetables. Fig Salad – Slightly sweet and slightly tart, this salad also works well as an appetizer or dessert. Brownie Bites – You won’t believe these brownie bites are completely raw and fruit-based! Almond-Blueberry Gelatin Parfaits – The flavors and colors of the almond and blueberry gelatins play off each other beautifully in this dessert. Baobab Butter Squares – These squares are like lemon bars but made with antioxidant-rich baobab! 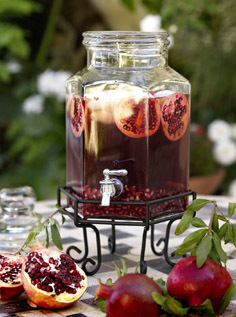 Pomegranate Iced Tea – This is a beautiful drink for any buffet. 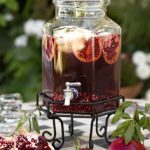 Combining antioxidant-rich pomegranates with the catechins in black tea gives your body extra free-radical-fighting power to combat aging. Cinnamon Coffee – This delicious cold-weather drink has a host of health benefits. Both cinnamon and nutmeg decrease inflammation inside the body.